The Advanced Dairy Chemistry series was first published in four volumes in the 1980s (under the title Developments in Dairy Chemistry) and revised in three volumes in the 1990s. The third edition of this series commenced with the publication of Volume 1 (Proteins) in 2003 and Volume 2 (Lipids) in 2006. With a total of 2,949 pages and 66 chapters in its three volumes written by well in excess of one hundred scientists from 15 countries, the third edition of the Advanced Dairy Chemistry series is by far the most comprehensive treatise on the chemistry of milk and dairy products ever published. This series has become the leading reference source on dairy chemistry, providing in-depth coverage of milk proteins, lipids, lactose, water and minor constituents for research institutes, academics and postgraduate students in universities, milk processing companies, and regulatory agencies worldwide. 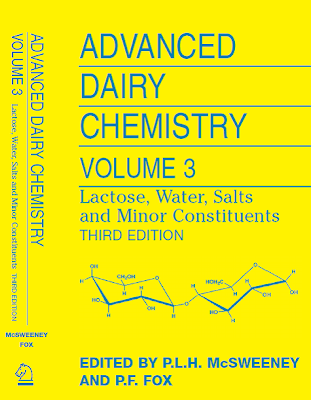 The final volume in the third edition of the series, Advanced Dairy Chemistry Volume 3: Lactose, Water, Salts, and Minor Constituents, edited by PLH McSweeney and PF Fox, has just been published by Springer (New York) and reviews the extensive literature on lactose and its significance in milk products. This volume also reviews the literature on milk salts, vitamins, milk flavours and off-flavours and the behaviour of water in dairy products.